I dunno what the chances are that one can have one title for two different books about two totally different things, but I guess with chicklit, it was only a matter of time (particularly when the title is a line from marital vows. There’s probs 4 other ones). 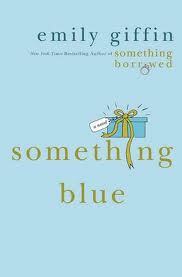 I just finished reading Something Borrowed by Martina Reilly (I love those Irish lasses. 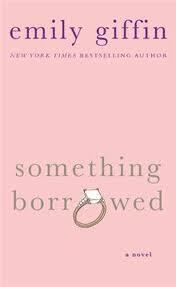 #teamMarianKeyes) a month after I read Something Borrowed by Emily Giffin (and I have just finished Something Blue by her as well, so here goes). I was pleasantly surprised by this lassie. I read the book and watched the movie (and of course there were inconsistencies) and they were both pretty good. It’s about the classic mousy sidekick who falls in love with her shallow diva best friend’s fiancee. As far as chicklit goes, it’s a strong 3. Yay! The Irish! I love it all. Leprechauns and shamrocks espesh. This one’s about a girl who is adopted and wants to find her birth mother, on the road to conquering truths about her life and herself, and everything she thought to be real. I also quite liked this girl. She writes very simply. She is not into ati description or anything too fancy, which is exactly how I like my written material to be. Frills are nice, but sometimes, you want to keep it basic. In fact, she is almost too basic. I almost didn’t like her, until I discovered that basic is really the way to get to the heartstrings. I felt tears more than once aching to get out and I had to remind myself I’m not a crier. Not really. I did like this one, and I didn’t think I was going to. A strong 3. Please read the Purple Hibiscus by Chimamanda Adichie. I want to hear your thoughts…. I am halfway through Half a Yellow Sun, so when I finally do, I will. Deal? Watched Skyfall? Looooved Skyfall is more like it. Despite only the 11:30pm tickets being available and despite my date bouncing on me (yeah, I was one of those sad people that watch movies alone, that day). Loved Bond. Loved the theme song. Bardem killed it. Moneypenny caught me by surprise. Emma!!!!!! Bloody hell. I might go watch it again. MIGHT go watch it again??? i'm a bit behind the pack here, no skyfall yet, BUT, i hired avengers over the weekend and i LOVED it. what a top flick!! so well made and just thoroughly entertaining. …..& re chicklit books if you get sick of them i could lend you a couple of cricketer's autobiographies. uhmm…yeah, might. A strong might. What, the movie doesn't warrant it. I think I'd enjoy it a second time. Nothing major….I don't bother with continuity issues unless a movie is supremely annoying like the Timberlake In Time flick which was a total waste of my money and 90minutes but at the start of the film, when they're fighting on the train, 00 tries to punch the bad guy with the scooper-dozer thing. Later on when they're going through the tunnel they have to lie flat on the traintop lest they get an ouchie. How exactly was the dozer going to fit in the tunnel if it hadn't gotten unhooked from the train…but that's a minor thing. What I didn't like is how they brushed off how he gets out of the water. You assume the girl saved him and you see him have a thing with her but from getting shot, slammed into the river, saved and nursed to health and all that is brushed off like that seemed…off. But i MIGHT go see it again. A strong might. Like a 78% might. Maybe in a movie that was 2 and a half hours long, they had no time to work in his recuperation? In the grand scheme of things, though…he's Bond. James Bond. Of COURSE he survived an eency, teency weency little thing like getting shot.